Whether you’re cooking supper for your family or a special dinner party for guests there are some basic concepts that will apply when planning any meal. Planning an Asian meal is no different in those respects. One extra thing to bear in mind though, if entertaining guests of different faiths, is that Hindus will generally not eat beef and Muslims won’t eat pork. Also many Hindus and Buddhists are vegetarian. A good general rule to follow is to provide one dish per person plus one extra plus rice. For Thai or Indian meals in particular, make sure you provide a choice of spicy and mild. Make sure you have something to suit everyone’s tastes: you don’t want your guests to go home hungry! In the west we tend to plan in advance when we’re having guests for a meal. Spending ages browsing through cookery books or websites like this one, choosing dishes that we’ve tried before and know will be tasty, or, if we’re feeling brave, trying something completely new. Then when we’ve decided we make shopping lists and head off for the supermarket only to find that the vital ingredient for our piece de resistance isn’t available! Crisis looms. In India, Thailand or China, the cook will visit the market and plan the meal depending on what’s fresh, in season and looking good. That may sound very simple but there’s a lot more to planning an Asian meal than that! The carefully planned Asian meal is a treat for all the senses. The cook will consider how the finished dish will smell. Will it attract the diners? Will it make mouths water in anticipation? How will the colours of the finished meal go together? Will they complement each other without being bland and all looking the same? What about the texture of the constituents? Are they pleasantly different? Is there a mix of chewy, smooth, crunchy? And then there’s the taste itself. Can you find a balance between salty, sour, sweet, spicy and bland? In Chinese lore, balancing yin and yang is very important to good health and well-being. 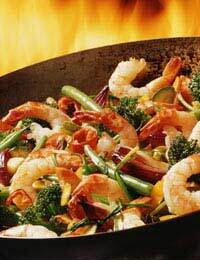 Proteins – meat and seafood – are secondary to grain, noodle and vegetable dishes. The rice or noodle dish will be the centre of the meal. Other dishes will be chosen to add flavour and texture to it. Plan the order of dishes so that the spicier ones come later in the meal so they don’t overwhelm the delicate ones. Choose contrasting and complementary foods. The meal isn’t about one dish but about all of them. A typical Indian meal would include rice, 1 dry curry, 1 or 2 wet dishes, bread, raita and pickles. An everyday meal wouldn’t have a starter but may offer poppadoms or a salad; similarly dessert would be a choice of fresh fruit rather than a pudding. Likewise an everyday Chinese meal wouldn’t have a starter but, along with rice or noodles and choice of dishes, may well include soup. This may be served with the meal rather than before it, as an accompanying drink that also cleanses the palate in between courses. By preparing in advance, even what seems like a complicated Asian meal needn’t be too hard on the cook. Early in the day chop plenty of garlic, ginger and anything you know you will need lots of. Pre-slice vegetables - but not too early as they lose their goodness – ready for stir-frying at the last moment. Prepare and chill soup to be served cold or ready for reheating. Put braised meats to cook gently while other preparations go ahead. Steam vegetables or dumplings on a back burner. Make the batter for deep-frying and have the vegetables ready to go in it. And then you’ll be ready to serve an Asian meal that will delight your guests!